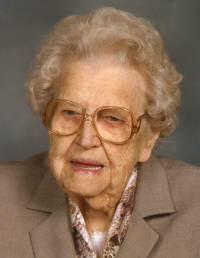 Agnes J. Eversgerd, nee Haukap, 95, of Germantown, died Saturday, August 30, 2008 at Aviston Countryside Manor. Mrs. Eversgerd was born January 6, 1913 in Germantown, to J. Frank and Elizabeth (Albers) Haukap; they preceded her in death. She married Henry J. Eversgerd on August 8, 1934 at St. Boniface Church in Germantown; he preceded her in death on November 7, 1973. Also preceded in death by daughters, Norma Jean Wehking and Dolores Kohrmann; a son, Jim Eversgerd; a granddaughter, Carla Jean Wehking; a great-grandson, Jamie Kohrmann; brothers, Ben Haukap, Lawrence Haukap, Herman Haukap, and Matt Haukap; a sister, Dorothy Koelling; a sister-in-law, Margaret Haag. Surviving are her children, John “Jack” (friend Rosie Olliges) Eversgerd of Germantown, Dan (Charlene) Eversgerd of Germantown, Bill (Toni) Eversgerd of East Meadow, NY, Tom (Jan) Eversgerd of Germantown, and Shirley Eversgerd of Germantown. A son-in-law, Virgil (Betty) Wehking of Moro, IL. Sisters, Marie Huff and Wilma Pfitzer both of St. Louis. Agnes was a homemaker and a member of St. Boniface Church and Altar Sodality. Funeral Mass of Christian Burial will be Wednesday, September 3, 2008 at 11:00 AM at St. Boniface Catholic Church in Germantown with Fr. James Buerster officiating. Interment will follow in St. Boniface Cemetery, Germantown. Visitation will be Tuesday. September 2, 2008 from 4:00-9:00 PM and again on Wednesday, September 3, 2008 from 8:00-10:45 AM at the Moss Funeral Home in Germantown. Memorials may be made to Food for the Poor or St. Boniface Cemetery and will be received at the funeral home.